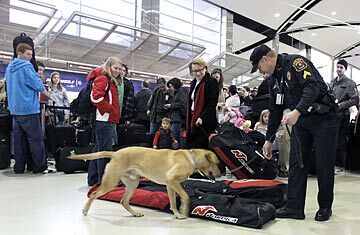 U.S. aviation security screening has come under deserved criticism in the wake of the attempted bombing of Detroit-bound Northwest Airlines Flight 253 on Christmas Day. After telling journalists on Dec. 27 that the failure of the attack showed that the security system had effectively worked, Homeland Security Secretary Janet Napolitano backtracked on Monday, telling the Today show, "Our system did not work in this instance. No one is happy or satisfied with that." But in one small way, the system did work, because screening effectively forced the alleged bomber, Umar Farouk Abdulmutallab, to use a liquid chemical rather than a more basic or reliable detonator to trigger the powdered explosive that was sewn into his underwear and smuggled on board. And it turns out that pulling off such an explosion on a plane is no simple feat. "It's a bit more complicated than just putting a flame to the powder," says Jimmie Carol Oxley, the director of the Center of Excellence in Explosives Detection, Mitigation, Response and Characterization at the University of Rhode Island at Kingston. The explosive Abdulmutallab allegedly used is called pentaerythritol tetranitrate (PETN), and it is powerful even in quantities as small as a hundredth of a pound. It comes from the same chemical family as nitroglycerin and has a long history of use in terrorist attacks. Though PETN itself is controlled, the chemicals used to make it aren't that hard to find  and Abdulmutallab or any other bombers would likely be able to obtain the explosive on the black market if they couldn't synthesize it themselves. The shoe bomber Richard Reid tried to use PETN to destroy a plane over the Atlantic in 2001, and the Saudi Arabian government has reported that the chemical was used in a thwarted assassination attempt on the country's counterterrorism chief in August. "It's a nice high explosive," says Oxley. But like most stable explosives it's not easy to ignite  it requires an initial explosion. Usually that would be accomplished with a detonator like a blasting cap, but that device would have almost surely shown up on any airport X-ray machine or metal detector. Instead, Abdulmutallab allegedly brought along a syringe, which could have been filled with a liquid explosive like nitroglycerin. If done correctly, the primer explosion could have set off the PETN, which might have blown a hole in the side of the plane. "It looked like he was trying to use a chemical initiation, and that takes a lot of pre-experimentation to find out what would work," says Oxley. "He succeeded in getting a fire, but that was it." Having to use a liquid primer rather than a detonator makes the bomber's task more difficult but not impossible. It will not be easy to prevent similar attacks in the future without ramped-up airport security. While airport "puffer" machines, which blow air on passengers to collect residue, might have detected the PETN, it's not certain, and many airports lack the machines. "There's always room for improvement in airport security, but it's always going to be a trade-off between convenience and commerce," says Oxley. In the meantime, we may have to count on what worked on Flight 253: luck. Read "Detroit Terrorism Suspect: The Nigeria Connection." Read "Domestic-Terrorism Incidents Hit a Peak in 2009."